The Corps of Discovery commemorative disks were set to honor the surveying and mapping contributions of Lewis and Clark and their expedition party, called the Corps of Discovery. This disk was located on the Lewis and Clark Trail, on the banks of the Ohio River in Louisville, Kentucky. 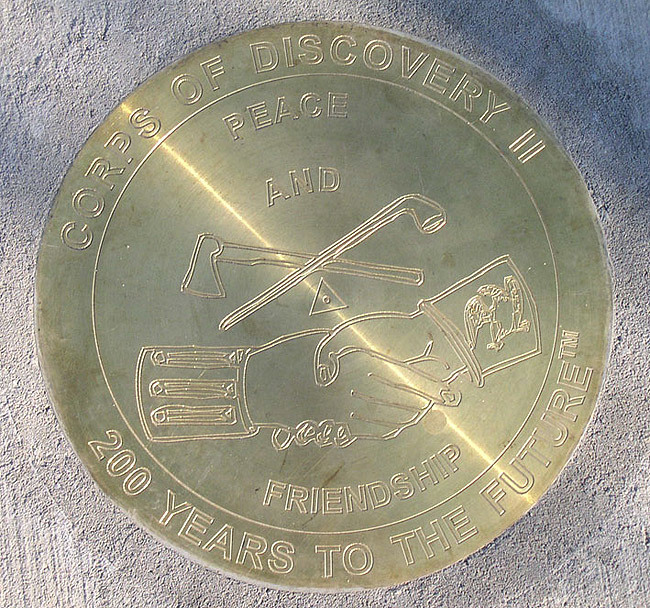 NOAA's National Geodetic Survey and the Kentucky Association of Professional Land Surveyors set this Corps of Discovery II commemorative disk on October 18, 2004, in Louisville, Kentucky, on the Lewis and Clark Trail. 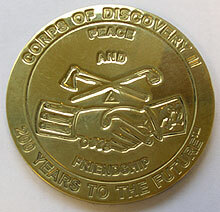 One of the 3¾-inch bronze Corps of Discovery commemorative disks set at Lewis and Clark historical sites along the trail. High resolution available. (648kb, 2048x1536). About 15 Corps of Discovery commemorative disks were set to honor the 200th anniversary of the surveying and mapping contributions of Lewis and Clark. The first disk in the series was set in January 2003, at the home of President Thomas Jefferson in Monticello, Virginia. The last disk was set in September 2006, under the Gateway Arch in St. Louis, Missouri. Disks were also set at the U.S. Mints in Philadelphia and Denver, and at other events commemorating the Corps of Discovery Bicentennial along the trail followed by Lewis and Clark and their expedition party between 1803 and 1806. 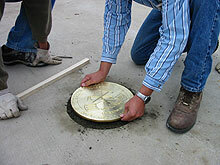 Twelve-inch bronze disks were set at major events, and many other 3¾-inch bronze disks were set by state surveying societies at other Lewis and Clark historical sites along the trail. Both sizes of disks have the same design. In 1803, President Thomas Jefferson sent an expedition westward to find and map a transcontinental water route to the Pacific Ocean. With approval from Congress, Captains Meriwether Lewis and William Clark embarked on their legendary three-year journey to explore the uncharted West. 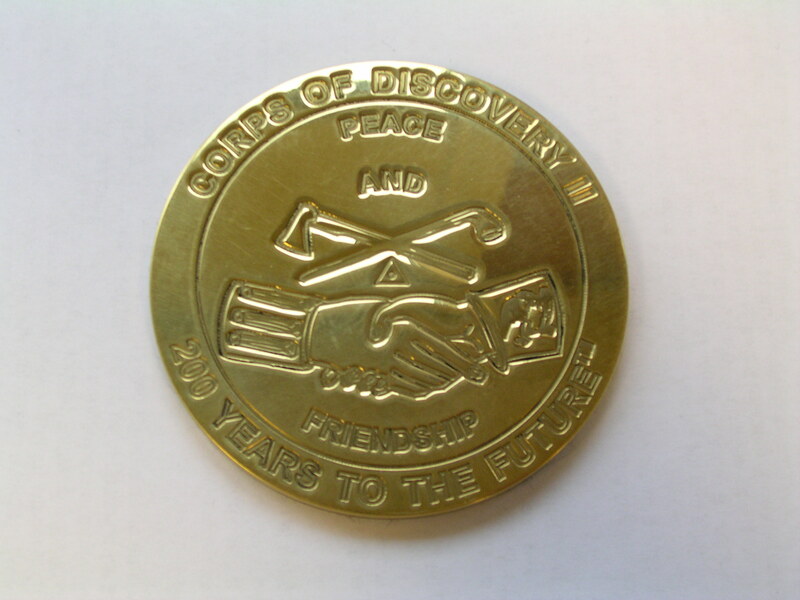 The expedition included 33 permanent party members, known as the Corps of Discovery. They reached the Pacific Ocean on November 7, 1805. On September 23, 1806, the Lewis and Clark Expedition officially ended when the explorers headed back east and arrived in St. Louis, Missouri. NOAA is participating in the Lewis and Clark Bicentennial by placing commemorative marks at each signature event location.